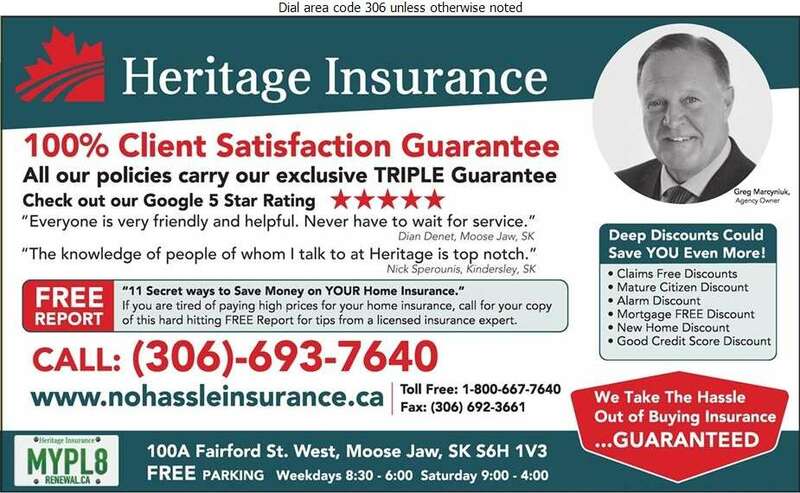 Serving Regina, Moose Jaw and surrounding areas, Heritage Insurance Ltd., specializes in home, business, flood, contractor, farm and trucking insurance. We are a very personable company with high customer service standards. At Heritage, we make sure that each client is correctly represented and informed of every step of the insurance process. Our brokers make sure that they are in contact with you on a regular basis, to keep you updated. We believe in our customer service professionals so much, that we offer a 100% client satisfaction guarantee. SGI online services can be accessed through our website. I was pleased with the service received when I was getting a new policy, and with continuously getting great service. The staff at Heritage Insurance are very knowledgeable in what they do. They are friendly and very helpful with any questions or concerns I may have. They are great people and a great company. The service provided for you as soon as you walk in is great. I would give them a 10 out of 10. They are great people and everyone in the office provided me with excellent service. They are just great all I can say is wow. They even let you phone in changes to your policies I have never been able to do that before it is great. We really appreciate you finding a more reasonably priced insurance and making sure we have the same coverage. The broker that we worked with was extremely knowledgeable. He was quick to get back to us with any questions that I had about the coverage.